I want to take this opportunity to acknowledge the excellent service I received from your staff who undertook the work of installing pendant lights, fans and power points in my new home recently. From my first phone call to you, the initial quote received promptly, the booking of a time to complete the work, the process was smooth, professional, yet friendly. Cassandra and Ben worked excellently as a team. Nothing was too much trouble, and they consulted with me throughout the whole process. They meticulously went about their work, placing down sheets to protect areas where they were working and cleaned up wonderfully after they completed their work. I am not on Facebook so will just have to send you a few words of thanks for the prompt and efficient service you provided us particularly when three other local electricians did not even bother to return our calls. Thank you. Tony and Kay Banksia Beach. Hans Electrical Service provided an efficient, prompt and most satisfactory service to us and we are grateful to them and their courteous staff. Thank you for your for electrical service . The young lady tradie was prompt, very professional and polite. I’m very happy with the work carried out and would recommend your services to others. Regards, Bruno Tooming, Bribie Island. We have been using your services three times now and its been a pleasure to deal with your company on all occasions but yesterday you outdid yourself. The young man who arrived to fix our PowerPoint was a delightful example of good manners and work ethics. We will recommend your company without hesitation. Thank you Petra for your helpfulness and communication throughout our work. Thank you Hans for the work you did for us at our home. We appreciated your prompt service, your honesty when the work was less than quoted, and your helpfulness throughout our dealings with you. We would have no hesitation in recommending you to our friends. We appreciate the quality of Hans Electrical work from first contact and throughout each step of the job. As recent part time residents to Bribie our first contact with Petra was welcoming and informative. Hans heads up a professional team. He takes the time to meet with clients and explains what is needed. Hans is reliable, responsive and feedback is given immediately and his team leave the work site clean and tidy. We happily recommend Hans Electrical and will continue to use his services exclusively. I’ve been meaning to get around to send you and Hans an email to thank you for the work completed at my place last week. It was great to have work done without any hassles, I am very happy with all the work completed and my house was left very clean and tidy. Your service from my enquiry to the job being completed is very professional. I will definitely recommend you to anyone looking for an electrician. Hans Electrical Service, If you ever think that tradies aren’t reliable, then think again, because recently our aged Ceramic Cooktop lost one of the plates, and instead of just calling someone in to repair it and continue to hate the slow old thing we went to a Boxing Day sale and invested in an Induction Cooktop. Who would we get to install it? Harvey Norman did recommend a couple of electricians. One did not seem terribly interested in having our business, and the other did not answer their phone nor did they return our call. Still haven’t, for that matter. We have satisfactorily used Hans Electrical Service before, so left phone and email message , which was returned the next day and an appointment was made. The young couple from Hans Electrical who came to do the work set to to find out everything about the job, prepared their equipment, did measurements, unwrapped the new Cooktop to check if all pieces there and proceeded to remove the old Ceramic clunker. Again measurements were taken to ensure the new would fit, made it so. Heavier duty cabling was necessary and as our ceiling has insulation confirmed that it had been inspected for safety’s sake. When the new Bosch Induction Cooktop was installed we were given instructions on how it worked ( y’know, how to turn it on and off, etc) we were then taken to the power box, shown the new installation and advised how to check, and recommend that all switches be tested every 3 months. We have never been told this before. We have now used Hans Electrical on 2 occasions. Hans was recommended to us by our neighbour whose house he rewired. Hans Electrical service and attitude was way beyond our expectations of a “tradie”. After dealing with no shows for quotes and rude tradesman while doing our renovation is was a pleasant surprise to deal with a company who has professional service, a great attitude and is polite too! Many thanks Hans I can now SEE the wife without my torch. You’ve done a wonderful Job – NO mess! It was like you brought your own vacuum sweeper. When I went to the room where you put the new light and heat lamp – Bingo it lit up the bedroom too. I would definitely recommend you to many people – you do a great job. You are a pleasant, very polite and you should be TOP of the Business Table your work is PERFECT. Thank you, Hans, very much. Hans was recommended to me by a local in my area, so I spoke to Petra who organised a quote to be done for all the work required to upgrade our Switchboard.The quote was very competitive so we engaged Hans Electrical to perform the work. The work has now been promptly completed by Hans and his apprentice. I am delighted to recommend Hans Electrical Service to any who are looking for a reliable and competent professional service. I needed external and internal security cameras, security lights with motion sensors, and motion sensors fitted, as well as an external alarm. Hans and his team worked conscientiously to ensure everything was fitted and ready for Wi-Fi and Internet connection by the I.T. expert he sourced and arranged. When one light motion sensor failed to perform, he returned on the Show Day public holiday to fix it. Hans and his workers are people friendly as well as professionally proficient. I recommend Hans Electrical Service to any and all seeking expert electrical work. I will definitely get you back when I need to put power down to the shed. I am sometimes called a hard-nosed tough business person – I hardly EVER give “reviews ” or do company surveys on people or companies we work with…etc. Based in Sydney as a property management company we deal with lots of trades people and builders etc. Hans Electrical are usually good ! Went out of their way to help me! They did a great job – very thorough !!!!!!!!!!!!!!!!!! Customer focused, these people are good !!!!!!!!!!!!! A rare find – a really good genuine small business !!!! Thank you for the opportunity to have you do our electrical work. Having come from interstate and not knowing any local trades we were quite unsure of who to engage. We were very impressed with not only the professionalism of the work but the friendliness and politeness of you and your staff. Nothing we asked seemed to be a bother or too difficult. Thanks so much for the service from your Company today at Beachmere. The two electricians who attended and completed the work were extremely professional, polite and arrived as arranged. 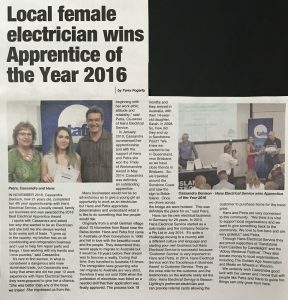 Cassandra, tonight we were delighted to read of your wonderful success as winner of Apprentice of the Year. We can think of no young person more worthy of the award. Your knowledge, execution of the job and above all else your people skills are A1. Of course part of your success is due to the opportunity Petra and Hans gave you and the skills you have been taught. It is such a pleasure to do business with all of you. Sorry we are not on Facebook but were indeed very satisfied with the prompt, courteous and efficient work that both Hans and Cassandra did. And we certainly appreciated the very reasonable cost considering the work we had requested. We will certainly call you next time we need electrical work done. This short note is to again thank you for the excellent service that you have provided us with. Originally you were recommended to us by the retailer [Beacon Lighting] that we purchased a fan, as the best to carry out the installation. That job was completed in a most efficient timely and pleasant manner. We then had you do another job and we were surprised to see that again you kept your allocated appointment and you and your employees curried out the job very efficiently and in most considerate manner. Beverley and I moved to the Island 10 years ago and although we met some very good tradesmen, we also met ones who promise and do not deliver, or are very sloppy, ill mannered and/or overcharge. We sincerely appreciate your effort to run an efficient and pleasant service providing organisation. Well done. We are again very satisfied with the work you have undertaken for us and are happy to recommend your business to anyone seeking the services of a qualified electrician. You have proven yourselves to be very efficient and reliable, in no small way due to the dedication and effort you both put in. Your flexibility and willingness to accommodate changes to requirements was very much appreciated. We wish you all the very best for your ongoing success. 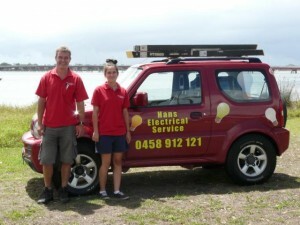 Hans Electrical Service is our first choice for electrician on Bribie Island. Hans, Petra, Josef and Cassandra are a very organised and proficient team who provide quality service and high level of workmanship in a timely fashion. Just remember “No one regretted buying quality”. We would like to recommend Hans Electrical Service for any electrical work you may need. We asked him for a quote for three ceiling fans which was promptly supplied with two alternatives. On accepting the quote we were given a date and time for installation which was duly kept.The work was completed efficiently and they cleaned up after their work . Just a short note to thank you for your excellent service. I’m new to the area and needed electrical work done. I appreciate your fast efficient work both through the office and onsite. It was good to have the work carried out at the time stated with minimal costs involved. I highly recommend your work. The service offered by Hans Electrical was terrific. The service was efficient with a problem solving focus. Clarification regarding the choice of products was very helpful. The service person was competent and energetic. That approach was reassuring. We would also like to thank you for the wonderful job you did. Cassandra is a very clever and inspiring young lady – she did an amazing job – I love how neat her work is (of course she has been trained by Hans which is so fortunate for her). Jan was great also. A very lovely young man, who was a pleasure to have here as well. He worked very hard digging that horrible trench of almost rock solid dirt. I felt sorry for him. But he kept on smiling through the heat. We look forward to seeing you again, as we are so happy to have found Electricians we love. Hans always comes promptly to provide technical advice and free quotes which provide full information about the work required and the costs involved. Your electricians carry out the work as scheduled in a professional and courteous manner. It is always a pleasure to do business with you. Over the past several month I have called upon Hans Electrical Service to carry out a range of electrical works in my house and in a rental property. My wife and I have been very pleased with every aspect of work. The responses to my requests have been prompt and timely, communication by the Service is excellent, the work itself is neat, tidy and professional and importantly, competitive in cost. One particular feature of Hans Electrical Service work is that they look for appropriate solutions, including doing extensive research, to find the best answer to service issues or requests. We have used Hans & his very competent young lady apprentice 3 times now. The first time was to install new hotplate in our kitchen, the second time to install a new wall oven & most recently, to remove our old ceiling fans & to supply & install 4 new fans. He was prompt, competitively priced made a first rate job of the installation, even cleaning up the small amount of mess made. As a member of the Management Committee of Bribie Island Orchid Society, we have approved electrical maintenance works carried out by Hans Electrical at our “Orchid House”, Bongaree & see no need to source other electrical contractor’s prices as we are very happy with his rates & service. Obviously we would have no hesitation in recommending the services of Hans Electrical. I have just recently moved into my new home at Banksia Beach and had the need for the provision of electrical services to install an outdoor water feature. I suffer from Parkinson Disease and I therefore need to carefully choose service providers due to my limited finances and desire to have work undertaken to meet my expectations. As a result, I tend to look for trust, integrity and reliability from service providers. When I contacted Hans Electrical Service, I was impressed by the prompt manner in which they provided me with an unconditional free quote for the work to be undertaken. I then accepted this quote and the work was promptly performed to my complete satisfaction, consistent with the quote and undertaken in a timely fashion. I have no hesitation in recommending Hans Electrical Service to those who may have similar circumstances to me, as I found them to provide their service with trust, reliability and integrity. It’s our pleasure to share our experience with yourself and your team, Petra, Andy, and Cassandra. Your service has been excellent. We’ve found Petra to be the most courteous business person we’ve ever come across, yourself and your team to be professional, and courteous, reliable and efficient, neat and thorough, and on top of that you have a pleasant sense of humour. We are very happy with your service and will be more than happy to recommend your business to friends and family when required. In the retirement resort we live in, you already have a very good reputation, which is why we chose you in the first place. I found your business operations to be honest, efficient, friendly and great value. You have made a considerable contribution getting our residence up to date and secure. I will have no hesitation in recommending your services to all and sundry. In addition I complement you on the attitude and work ethics of your apprentice Cassandra and employee Andy. It has been a pleasure dealing with you. Thank you Hans Electrical Service. Cassandra was a delightful presence in our home today. Efficient, confident and very capable. We would love her return for more electrical work. Thank you. Recently we had Hans Electrical perform some household electrical work for us. We found their work prompt, competent and efficient. We recommend them confidently. John and Clare. Just a quick note to let you know how much we appreciate the high level of service you provide at a very reasonable cost. We do not use any other electrical contractor, and I have not hesitated in recommending your services. Your service is very professional and I appreciate the fact that you leave everything neat and tidy when you’re done. Petra, your phone manner is very friendly and on the occasions that we have had to cancel and postpone, you were very understanding. Looking forward to dealing with you again. Hans Electrical Service was referred to us by friends in the area. We found Hans and his team to be prompt, reliable and courteous. They arrived on time and worked efficiently and quickly. We would have no hesitation in recommending them to others – their “ no callout fee” is an added bonus. From the word go, with the first phone call to Hans Electrical. It was Efficiency. Hans arrived on time to first look at the work needed. Gave an honest opinion of what we needed with both the good and bad points at issue. We were given a written quote on recognisable paper. Given advice on models of Electric Ovens and the websites to look at when Hans knew that we were “computerised”. From then on all contacts were done via E-Mail Services so both Hans Electrical and ourselves, knew exactly the date when the installation would be carried out. When the day came for the installation Hans was running late for our time schedule, but he had the common decency to inform of us his lateness. His work was carried out with professionalism and at the end we were able again use our computers to settle the account, with a Tax Invoice arriving within 24 hours on the completion. Summing up, if need came for an installation or electrical work, we would phone Hans Electrical for the necessary advice, quotes etc. If other Residents at North Lakes Retirement Resort asked us for a good firm for electrical installations we would have no hesitation in giving them the name of Hans Electrical Service. 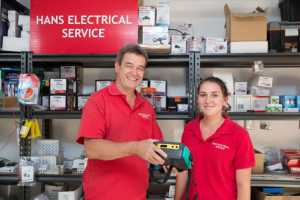 Monty Walters, N. L. R. R.
Having recently relocated to Bribie Island, Hans Electrical Service was recommended to us by several people, as a company we could rely on to do a good job. Hans arrived on time, worked like a beaver and completed the work in a very professional manner. His cheerful manner and his willingness to explain what needed to be done was greatly appreciated. G’day Hans. Just a quick note to thank you for the job you did for me. Surprise, surprise, a tradie that’s on time, cleans up after himself and doesn’t charge the earth. Those patio lights have really made a difference. Now I can see if the chops on the BBQ are burning or not. Love your work.